Fishing season on the big lake has officially came to an end for 2009....for me anyways. The below freezing temps this weekend forced us to winterize the boat. Besides being an avid angler, I'm also very into hunting and come fall my priorities start changing along with the leaves. As I said in my last post I was out in North Dakota for 4 days last week. My brother lives in Fargo so a buddy, and I met him there and drove to the North Dakota Badlands. 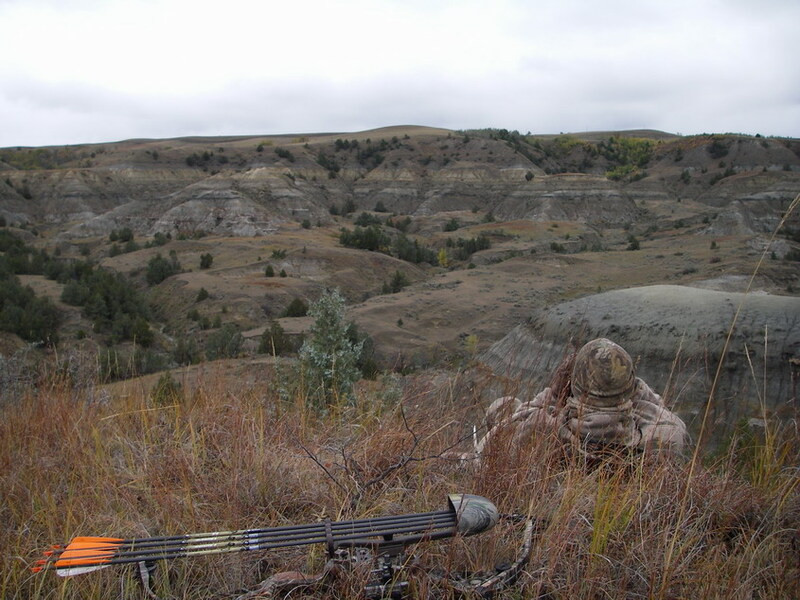 This was my first trip ever for mule deer, and with North Dakota's stringent lottery for tags archery hunting was the only possibility for a non-resident. The country was absolutely stunning...the weather was not. Thursday through Saturday we faced pouring rain and sustained 30mph wind gusting to 45-50mph. Even with the horrible weather we managed to see plenty of deer, in the neighborhood of 200-300, mostly mulies with the occasional whitetail mixed in, in addition I saw my first ever mountain lion!! For those not familiar with this type of hunt it is all spot and stalk, given the rough terrain this can be quite a challenge. The trick is to glass from afar, and than use the terrain to work closer to your quarry. The three of us all ended up striking out, but it was quite the learning experience. I personally was able to stalk within 20 yards of a feeding 3x4 mulie and somehow missed the shot. Very painful, yet also rewarding to have gotten so close. My brother missed another and the amount of failed stalks shouldn't be mentioned. All and all a great time and highly recommended for a cheap 100% public land fair chase hunt.